Mr. Denton has practiced law for 35 years. He has won many difficult cases that other lawyers would never have taken, some of which resulted in verdicts of a million dollars or more. A former Vietnam helicopter pilot, his first legal specialty was aviation accident litigation, which he practiced exclusively in Portland, Oregon for two years. He then returned to his hometown, Virginia Beach, Virginia, and opened his own law practice. He has devoted his career to righting wrongs against high odds. His current and former adversaries comprise a long list of powerful corporations and prestigious lawyers and law firms. He likes to go to trial. 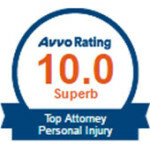 He has been given a “Pre-Eminent” rating by the leading lawyer rating service in the country. Since early 2011, he has won jury verdicts totaling nearly $10,000,000 and numerous lesser settlements.